There is nothing very new outside. The winter is going to stay here for at least two months. 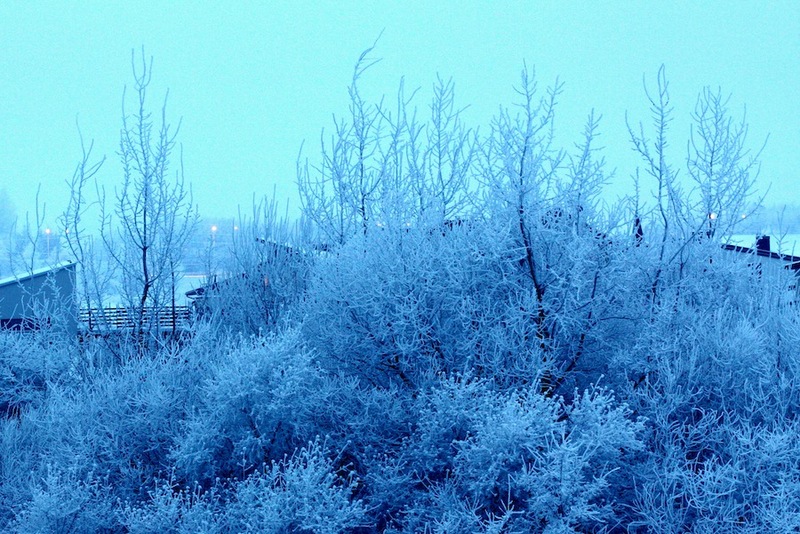 January and February usually are the coldest months of the year in Lithuania. Global warming does not impact duration of winter here yet. So in my world of gardening there’s still a lot of time for dreaming, reading and learning. I found an interesting statement on Willow House Chronicles recently: “In fact, if you are 27 years old or younger, you’ve probably never experienced a colder-than-average month”. This info inspired me to check Lithuanian temperature statistics. In last two years February was much colder than average, the last December was colder than average too, as well as this January. The global warming here is not just about warming, it’s about extremes: colder winters, hotter summers, storms, rains, fogs, floods, droughts and sudden temperature swings. Sounds like a challenge. Just after Christmas we had the first thaw. Horrible driving and walking conditions and huge amount of water in my garden aside, the thaw gave a short opportunity to enjoy the evergreens. Frankly, I am not a big fan of evergreens; they do not have a lot of value under the thick coat of snow. But I like the feeling of order and stability they bring to the early spring. These plants are persistent. 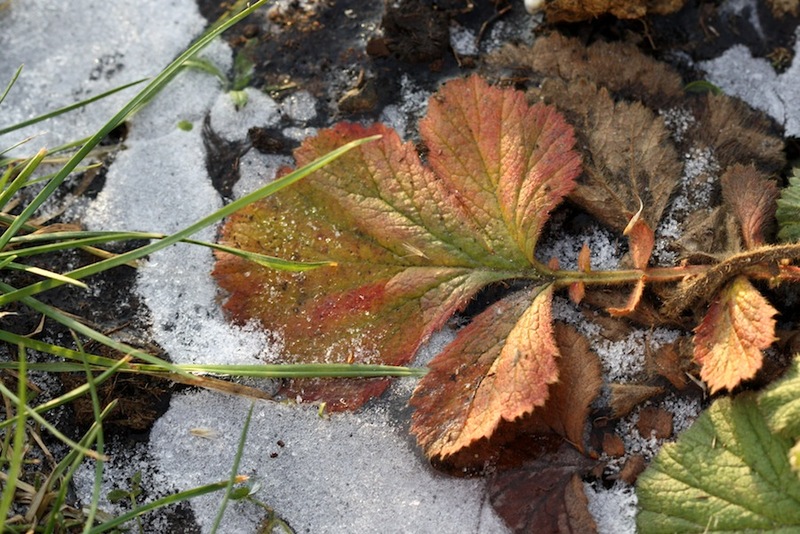 It is so inspiring to look how they are trying to stand up – just the snow goes away. But welcome inside! I am not a great indoor gardener. I usually forget and neglect my indoor plants during summer when there are so many interesting things going outside. From March I start to think about seeds and need some sunny windowsills for seedlings, so the pots with plants are placed in darker corners. Only really tough plants can survive this sort of “care”. I usually don’t buy indoor plants either, because I know that I am horrible host. But new plants still come in to my house. And some of them even bloom. 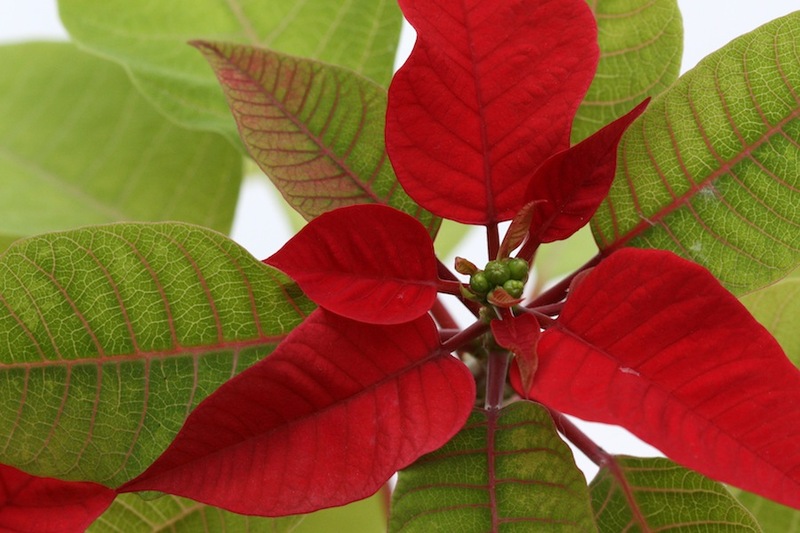 I am pretty proud of my poinsettias (Euphorbia pulcherrima). They successfully survived from the last year and rebloomed right on time. They are not as bushy and showy as those perfect plants offered all around before Christmas, but I hope they will do even better next year. 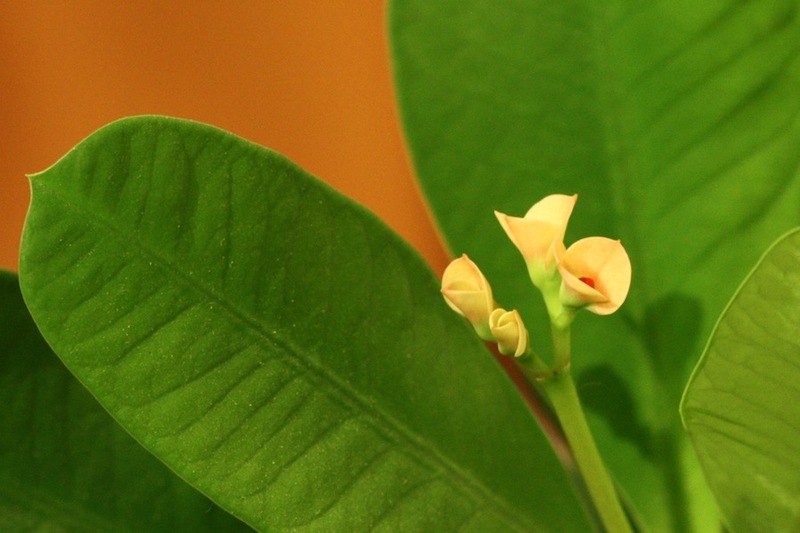 Another sort of Euphorbia, Euphorbia milii or Crown of Thorns just begins its blooming period after a short rest. 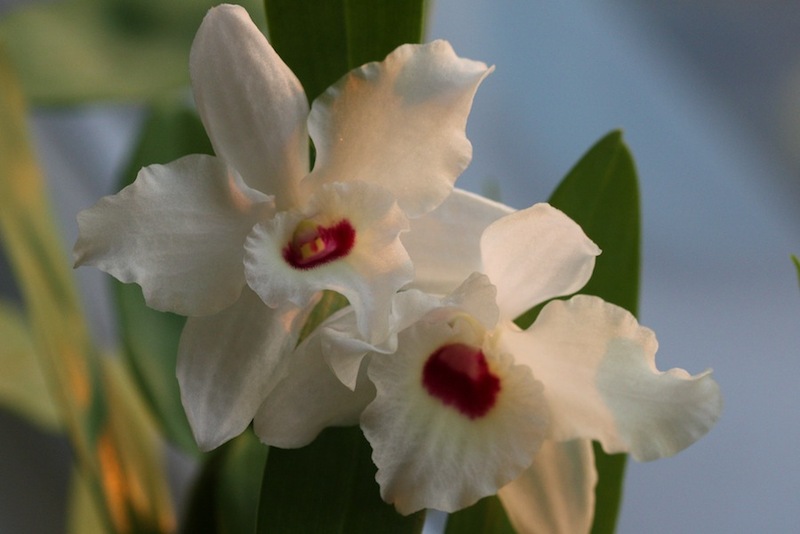 Some orchids are also very tough plants. 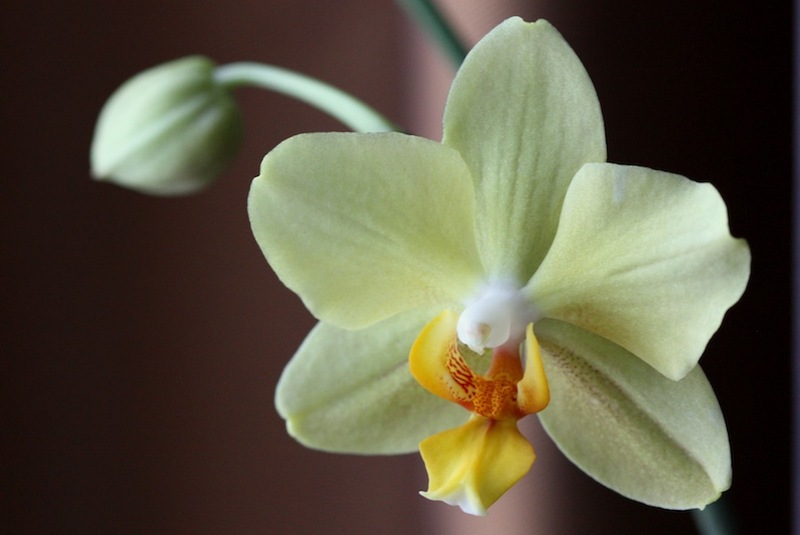 I grow phalaenopsis and dendrobium. They are the most persistent indoor bloomers in my house. 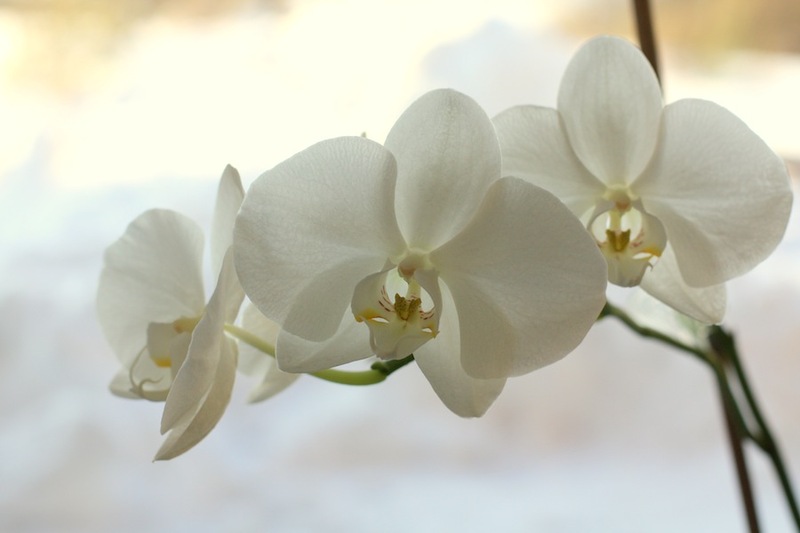 I am not crazy about orchids but the days of the winter would be much gloomier without them. The only indoor plant I really wanted and bought by myself is a bougainvillea. It is hard to explain my passion for these climbers, but bougainvilleas are one of the most beautiful plants for me. When we spent our family holidays in Greece, the amount of bougainvilleas in the terrace was the main criteria choosing a restaurant to eat (and it almost always worked, by the way…). 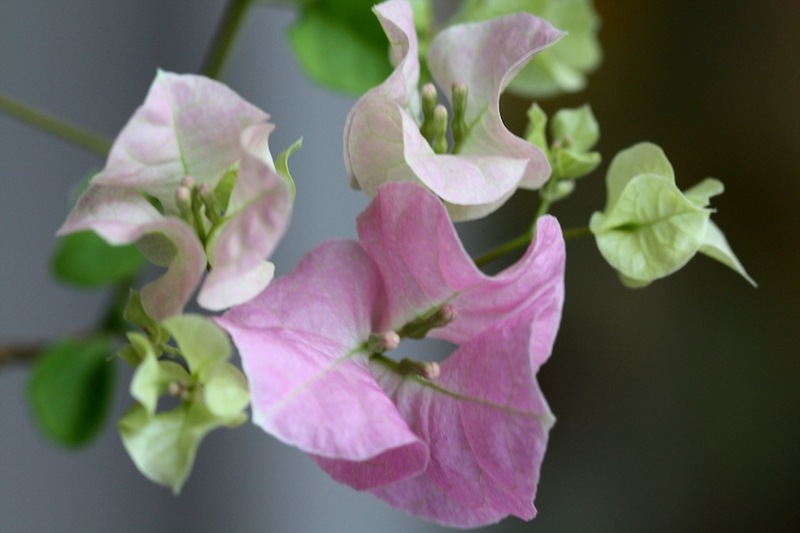 Bougainvilleas are strong and big climbers, but they also can be grown as small formed trees in the pot. I could not resist an opportunity to try, so I bought a small plant during one of spring sells. But growing bougainvilleas in the pot is not so easy. The summers here are too humid. My bougainvillea was damaged by fungus diseases during the summer outside. The winter time is also a challenge to this plant, because I can not create an optimal temperature: the temperature of my house is too high. My bougainvillea doesn’t want to branch and perform like an obedient small tree. It produces long single branches with strong horns reminding me its real nature. It seems like for two years we were looking at each other and trying each other’s patience. I hope this period of adaptation is in the past. My bougainvillea started to bloom. It is so softly magnificent. Happy GBBD! I hope you have a lot of blooms to enjoy. Don’t forget to visit Carols May Dream Gardens to find out what is going in gardens all over the world. Fabulous Orchids. Congratulations on getting the tropical Bougainvillea to flower. Well done. I also loved the flowering Moss shot. Thank you, Bernieh. 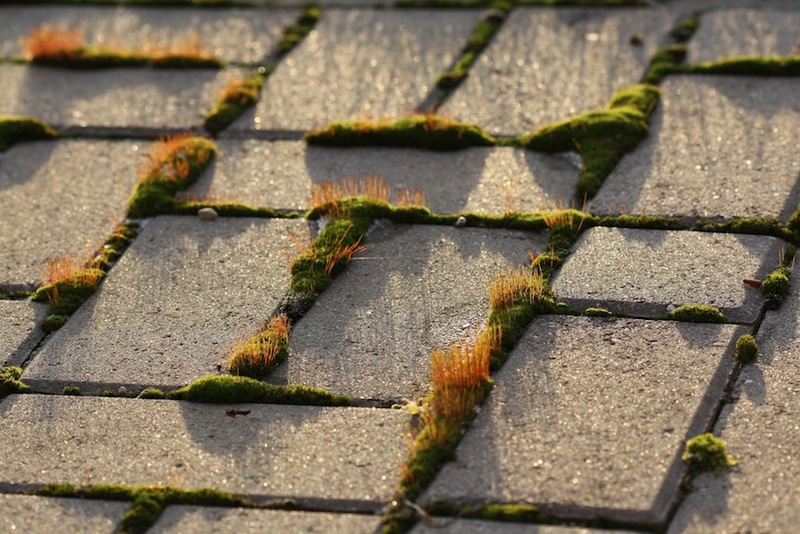 I liked the moss too. It looked a little bit naughty 🙂 Of course, the moss wouldn’t look so beautiful if I have had so many blooms as you in you garden. So beautiful. Real flush of blooms. Good luck! Hi, Jen, so nice to meet people form another side of the world on my blog 🙂 I repeatedly hear about fires in Australia on news channels. It is so sad and devastating. I hope people will learn to be a little bit more responsible and careful. Have a beautiful midsummer! Thanks for sharing your blooms and dreams as winter continues to grip the garden. And congrats on your success with the bougainvillea–the story and photos are enchanting. Simular latitude, on the Northern Plains, we likewise wait for Spring in late March or April. 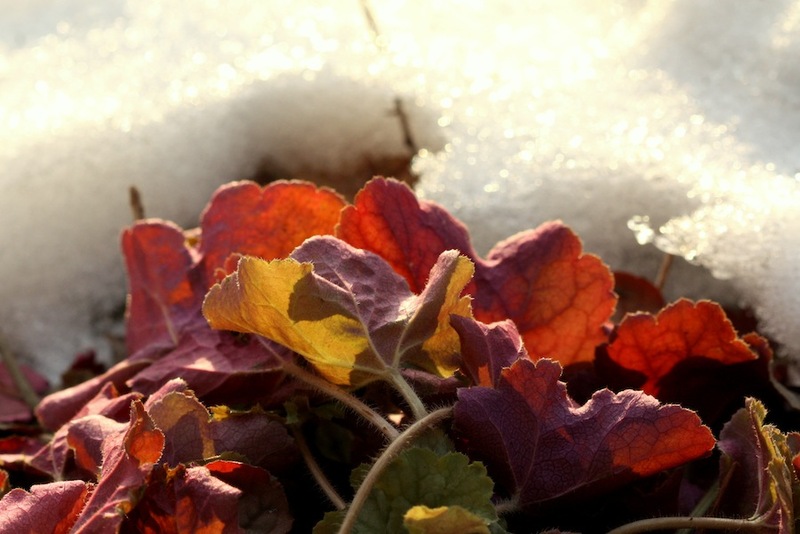 Your search for color in winter produced beautiful moments for us all to appreciate. Hi, John. Even snowdrops are mission impossible for January in Lithuania. There is a beautiful Russian fairy-tail about an evil step-mother who sends her step-daughter to the forest at the New Year eve to bring a bunch of snowdrops. In our Nordic conscious this is an example of an unfeasible challenge, at least without some help of magic forces 🙂 The average temperature of January here is about minus 5 oC and at some weeks it is bellow minus 20oC. The ground is frozen in. Several warm weeks are needed this freeze to go out and vegetation to start. Lithuanians call this “to unlock the earth”. Usually this happens just in the middle of March. So the only thing I can do now is to sigh looking at spring signs in English and American gardens. Your bougainvillea shots are enchanting. And your moss picture made me giggle. Stay warm! And Happy Garden Blogger Bloom Day! Thanks for your warm wishes, Laura! I’ve never managed to keep a poinsettia alive from one Christmas to the next. 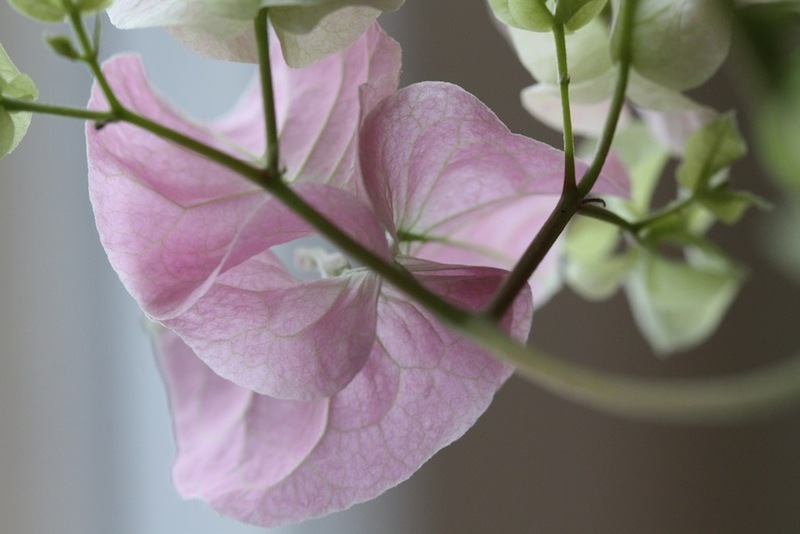 I love your photos and understand your love for bougainvilleas. Here they abound, just like in Greece.